into the existing fire alarm system. Fire Door Safety Week, 14-20 September 2015, reminds us of the vital role fire doors play in the protection of a building’s occupants. Their correct specification, installation and use is paramount to the safety of all those who use a facility. Clearly, however well intentioned, wedging open fire doors is illegal and provides no protection for a building and its occupants. In the event of a fire, fire doors are designed to stop smoke and flames from rapidly spreading through a building. Thankfully, to solve the wedged-open door problem, there’s a new generation of acoustic, digital door technology that’s a clever innovation; offering wire free protection to buildings and their occupants. Geofire’s innovative Agrippa ‘listen and learn’ acoustic range includes a magnetic fire door holder and an overhead battery powered ‘swing free’ fire door closer. 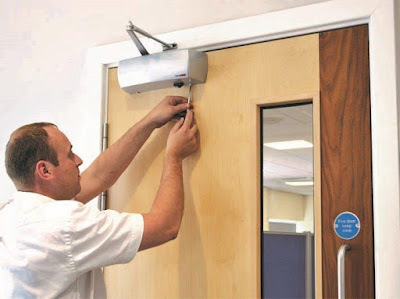 The Salamander radio controlled range of door holders and closers also connect wirelessly to a controller, which is easily wired into the existing fire alarm system. All products are battery powered and wire-free, saving time, installation costs and any disruption. UK manufacturer Geofire specialises in the manufacture of a wide range of electromagnetic door holders and other activation devices used widely as part of fire, security or ventilation systems.